This article chronicles the history and origins of the Teller–Ulam design, the technical concept behind modern thermonuclear weapons, also known as hydrogen bombs. This design, the details of which are military secrets known to only a handful of major nations, is believed to be used in virtually all modern nuclear weapons which make up the arsenals of the major nuclear powers. Physicist Edward Teller was for many years the chief force lobbying for research into developing fusion weapons. The idea of using the energy from a fission device to begin a fusion reaction was first proposed casually by the Italian physicist Enrico Fermi to his Hungarian physicist colleague Edward Teller in the fall of 1941 during what would soon become the Manhattan Project, the World War II effort by the United States and United Kingdom to develop the first nuclear weapons. Teller soon was a participant at Robert Oppenheimer's summer conference on the development of a fission bomb held at the University of California, Berkeley, where he guided discussion towards the idea of creating his "Super" bomb, which would hypothetically be many times more powerful than the yet-undeveloped fission weapon. Teller assumed creating the fission bomb would be nothing more than an engineering problem, and that the "Super" provided a much more interesting theoretical challenge. For the remainder of the war, however, the effort was focused on first developing fission weapons. Nevertheless, Teller continued to pursue the "Super", to the point of neglecting work assigned to him for the fission weapon at the secret Los Alamos lab where he worked (much of the work Teller declined to do was given instead, it turns out, to Klaus Fuchs, who was later discovered to be a spy for the Soviet Union). Teller was given some resources with which to study the "Super", and contacted his friend Maria Göppert-Mayer to help with laborious calculations relating to opacity. The "Super", however, proved elusive, and the calculations were incredibly difficult to perform, especially since there was no existing way to run small-scale tests of the principles involved (in comparison, the properties of fission could be more easily probed with cyclotrons, newly created nuclear reactors, and various other tests). After the atomic bombings of Japan, many scientists at Los Alamos rebelled against the notion of creating a weapon thousands of times more powerful than the first atomic bombs. For the scientists the question was in part technical—the weapon design was still quite uncertain and unworkable—and in part moral: such a weapon, they argued, could only be used against large civilian populations, and could thus only be used as a weapon of genocide. Many scientists, such as Teller's colleague Hans Bethe (who had discovered stellar nucleosynthesis, the nuclear fusion which takes place in the sun), urged that the United States should not develop such weapons and set an example towards the Soviet Union. Promoters of the weapon, including Teller and Berkeley physicists Ernest Lawrence and Luis Alvarez, argued that such a development was inevitable, and to deny such protection to the people of the United States—especially when the Soviet Union was likely to create such a weapon themselves—was itself an immoral and unwise act. Still others, such as Oppenheimer, simply thought that the existing stockpile of fissile material was better spent in attempting to develop a large arsenal of tactical atomic weapons rather than potentially squandered on the development of a few massive "Supers". When the Soviet Union exploded their own atomic bomb (dubbed "Joe 1" by the U.S.) in 1949, it caught Western analysts off guard, and President Harry S. Truman ordered a crash program to develop a hydrogen bomb in early 1950. Many scientists returned to Los Alamos to work on the "Super" program, but the initial attempts still seemed highly unworkable. In the "classical Super", it was thought that the heat alone from the fission bomb would be used to ignite the fusion material, but this proved to be impossible. For a while, many scientists thought (and many hoped) that the weapon itself would be impossible to construct. 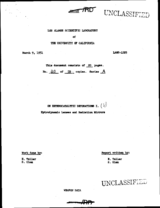 Classified paper by Teller and Ulam on March 9, 1951: On Heterocatalytic Detonations I: Hydrodynamic Lenses and Radiation Mirrors, in which they proposed the staged implosion(Teller–Ulam) design. This declassified version is heavily redacted. The exact history of the Teller–Ulam breakthrough is not completely known, due in part to numerous conflicting personal accounts and continued classification of documents which would reveal which was closer to the truth. Previous models of the "Super" had apparently placed the fusion fuel either surrounding the fission "trigger" (in a spherical formation) or at the heart of it (similar to a "boosted" weapon) in the hopes that the closer the fuel was to the fission explosion, the higher the chance it would ignite the fusion fuel by the sheer force of the heat generated. A view of the Sausage device casing, with its diagnostic and cryogenic equipment attached. The long pipes would receive the first bits of radiation from the primary and secondary ("Teller light") just before the device fully detonated. Other scientists (antagonistic to Teller, such as J. Carson Mark) have claimed that Teller would have never gotten any closer without the idea of Ulam. The nuclear weapons designer Ted Taylor was clear about assigning credit for the basic staging and compression ideas to Ulam, while giving Teller the credit for recognizing the critical role of radiation as opposed to hydrodynamic pressure. Teller became known in the press as the "father of the hydrogen bomb", a title which he did not seek to discourage. Many of Teller's colleagues were irritated that he seemed to enjoy taking full credit for something he had only a part in, and in response, with encouragement from Enrico Fermi, Teller authored an article titled "The Work of Many People," which appeared in Science magazine in February 1955, emphasizing that he was not alone in the weapon's development (he would later write in his memoirs that he had told a "white lie" in the 1955 article, and would imply that he should receive full credit for the weapon's invention). Hans Bethe, who also participated in the hydrogen bomb project, once drolly said, "For the sake of history, I think it is more precise to say that Ulam is the father, because he provided the seed, and Teller is the mother, because he remained with the child. As for me, I guess I am the midwife." 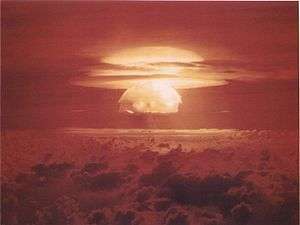 The dry-fuel device detonated in the "Castle Bravo" shot demonstrated that the Teller–Ulam design could be made deployable, but also that the final fission stage created large amounts of nuclear fallout. The Teller–Ulam breakthrough—the details of which are still classified—was apparently the separation of the fission and fusion components of the weapons, and to use the radiation produced by the fission bomb to first compress the fusion fuel before igniting it. Some sources have suggested that Ulam initially proposed compressing the secondary through the shock waves generated by the primary, and that it was Teller who then realized that the radiation from the primary would be able to accomplish the job (hence, "radiation implosion"). But compression alone would not have been enough and the other crucial idea—staging the bomb by separating the primary and secondary—seems to have been exclusively contributed by Ulam. The elegance of the design impressed many scientists, to the point that some who previously wondered if it were feasible suddenly believed it was inevitable, and that it would be created by both the USA and USSR. Even Oppenheimer, who was originally opposed to the project, called the idea "technically sweet". The "George" shot of Operation Greenhouse in 1951 tested the basic concept for the first time on a very small scale (and the next shot in the series, "Item", was the first boosted fission weapon), raising expectations to a near certainty that the concept would work. 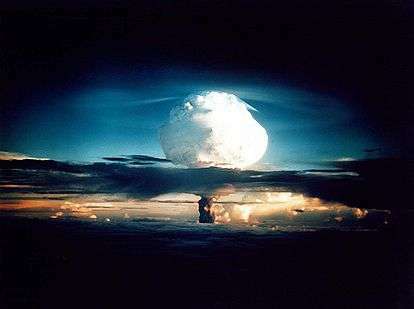 On November 1, 1952, the Teller–Ulam configuration was tested in the "Ivy Mike" shot at an island in the Enewetak atoll, with a yield of 10.4 megatons (over 450 times more powerful than the bomb dropped on Nagasaki during World War II). The device, dubbed the Sausage, used an extra-large fission bomb as a "trigger" and liquid deuterium—kept in its liquid state by 20 tons of cryogenic equipment—as its fusion fuel, and weighed around 80 tons altogether. Though an initial press blackout was attempted, it was soon announced that the U.S. had detonated a megaton-range hydrogen bomb. The elaborate refrigeration plant necessary to keep its fusion fuel in a liquid state meant that the "Ivy Mike" device was too heavy and too complex to be of practical use. 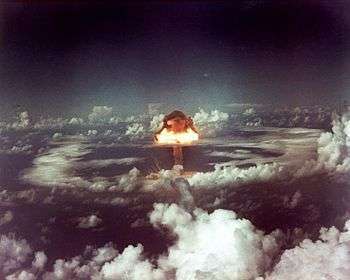 The first deployable Teller–Ulam weapon in the U.S. would not be developed until 1954, when the liquid deuterium fuel of the "Ivy Mike" device would be replaced with a dry fuel of lithium deuteride and tested in the "Castle Bravo" shot (the device was code-named the Shrimp). The dry lithium mixture performed much better than it was expected to, and the "Castle Bravo" device that was detonated in 1954 had a yield two and a half times greater than expected (at 15 Mt, it was also the most powerful bomb ever detonated by the United States). Because much of the yield came from the final fission stage of its uranium 238 tamper, it generated much nuclear fallout, which caused one of the worst nuclear accidents in U.S. history when unforeseen weather patterns blew it over populated areas of the atoll and Japanese fishermen on board the Daigo Fukuryu Maru. After an initial period focused on making multi-megaton hydrogen bombs, efforts in the United States shifted towards developing miniaturized Teller–Ulam weapons which could outfit Intercontinental Ballistic Missiles and Submarine Launched Ballistic Missiles. The last major design breakthrough in this respect was accomplished by the mid-1970s, when versions of the Teller–Ulam design were created which could fit on the end of a small MIRVed missile. In the Soviet Union, the scientists working on their own hydrogen bomb project also ran into difficulties in developing a megaton-range fusion weapon. Because Klaus Fuchs had only been at Los Alamos at a very early stage of the hydrogen bomb design (before the Teller–Ulam configuration had been completed), none of his espionage information was of much use, and the Soviet physicists working on the project had to develop their weapon independently. The first Soviet fusion design, developed by Andrei Sakharov and Vitaly Ginzburg in 1949 (before the Soviets had a working fission bomb), was dubbed the Sloika, after a Russian layered puff pastry, and was not of the Teller–Ulam configuration, but rather used alternating layers of fissile material and lithium deuteride fusion fuel spiked with tritium (this was later dubbed Sakharov's "First Idea"). Though nuclear fusion was technically achieved, it did not have the scaling property of a "staged" weapon, and their first "hydrogen bomb" test, "Joe 4" is no longer considered to be a "true" hydrogen bomb, and is rather considered a hybrid fission/fusion device more similar to a large boosted fission weapon than a Teller–Ulam weapon (though using an order of magnitude more fusion fuel than a boosted weapon). Detonated in 1953 with a yield equivalent to 400 kilotons of TNT (only 15%–20% from fusion), the Sloika device did, however, have the advantage of being a weapon which could actually be delivered to a military target, unlike the "Ivy Mike" device, though it was never widely deployed. Teller had proposed a similar design as early as 1946, dubbed the "Alarm Clock" (meant to "wake up" research into the "Super"), though it was calculated to be ultimately not worth the effort and no prototype was ever developed or tested. Attempts to use a Sloika design to achieve megaton-range results proved unfeasible in the USSR as it had in the calculations done in the USA (though its value as a practical weapon — being 20 times more powerful than their first fission bomb — should not be underestimated), and the Soviet physicists calculated that at best the design might yield a single megaton of energy if pushed to its limits. After the U.S. tested the "Ivy Mike" device in 1952, proving that a multimegaton bomb could be created, the Soviets searched for an additional design, while continuing to work on improving the Sloika (the "First Idea"). The "Second Idea", as Sakharov referred to it in his memoirs, was a previous proposal by Ginzburg in November 1948 to use lithium deuteride in the bomb, which would, in the course of being bombarded by neutrons, produce tritium. In late 1953, physicist Viktor Davidenko achieved the first breakthrough, that of keeping the primary and secondary parts of the bombs in separate pieces ("staging"). The next breakthrough was discovered and developed by Sakharov and Yakov Zeldovich, that of using the X-rays from the fission bomb to compress the secondary before fusion ("radiation implosion"), in the spring of 1954. Sakharov's "Third Idea", as the Teller–Ulam design was known in the USSR, was tested in the shot "RDS-37" in November 1955 with a yield of 1.6 Mt. At that time, Soviet research was not organized on a sufficiently high level, and useful results were not obtained, although radiochemical analyses of samples of fallout could have provided some useful information about the materials used to produce the explosion. 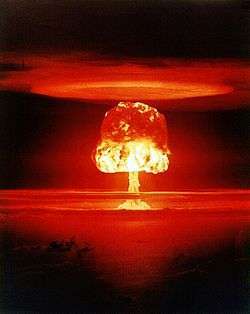 The relationship between certain short-lived isotopes formed in the course of thermonuclear reactions could have made it possible to judge the degree of compression of the thermonuclear fuel, but knowing the degree of compression would not have allowed Soviet scientists to conclude exactly how the exploded device had been made, and it would not have revealed its design. 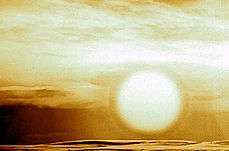 Fireball of the Tsar Bomba (RDS-220), the largest weapon ever detonated (1961). Dropped from over 10 km and detonated at 4 km high, its fireball would have touched the ground were it not for the shock wave from the explosion reflecting off the ground and striking the bottom of the fireball, and nearly reached as high as the altitude of the deploying Tu-95 bomber. The RDS-220 test demonstrated how "staging" could be used to develop arbitrarily powerful weapons. Sakharov stated in his memoirs that though he and Davidenko had new snow in cardboard boxes several days after the "Mike" test with the hope of analyzing them for information, a chemist at Arzamas-16 (the Soviet weapons laboratory) had mistakenly poured the concentrate down the drain before it could be analyzed. Only in the fall of 1952 did the Soviet Union set up an organized system for monitoring fallout data. Nonetheless, the memoirs also say that the yield from one of the American tests, which became an international incident, involving Japan, told Sakharov that the US design was much better than theirs, and he decided that they must have exploded a separate fission bomb and somehow used its energy to compress the lithium deuteride. But how, he asked himself, can an explosion to one side be used to compress the ball of fusion fuel within 5% of symmetry? Then it hit him! Focus the X-rays! The Soviets demonstrated the power of the "staging" concept in October 1961 when they detonated the massive and unwieldy Tsar Bomba, a 50 Mt hydrogen bomb which derived almost 97% of its energy from fusion rather than fission—its uranium tamper was replaced with one of lead shortly before firing, in an effort to prevent excessive nuclear fallout. Had it been fired in its "full" form, it would have yielded at around 100 Mt of TNT. The weapon was technically deployable (it was tested by dropping it from a specially modified bomber), but militarily impractical, and was developed and tested primarily as a show of Soviet strength. It was the largest nuclear weapon developed and tested by any country. The details of the development of the Teller–Ulam design in other countries are less well known. In any event, United Kingdom had initial difficulty in its development of it, failing in its first attempt in May 1957 (its "Grapple I" test failed to ignite as planned, though much of its energy did come from fusion in its secondary), though succeeded in its second attempt in its November 1957 "Grapple X" test (which yielded 1.8 Mt). The British development of the Teller–Ulam design was apparently independent, though they were allowed to share in some U.S. fallout data which may have been useful to them. After their successful detonation of a megaton-range device (and thus their practical understanding of the Teller–Ulam design "secret"), the United States agreed to exchange some of its nuclear designs with Great Britain, leading to the 1958 US-UK Mutual Defence Agreement. The People's Republic of China detonated its first device using a Teller–Ulam design June 1967 ("Test No. 6"), a mere 32 months after detonating its first fission weapon (the shortest fission-to-fusion development yet known), with a yield of 3.3 Mt. Little is known about the Chinese thermonuclear program, however. Very little is known about the French development of the Teller–Ulam design beyond the fact that they detonated a 2.6 Mt device in the "Canopus" test in August 1968. In 1998, India claimed to detonate a "hydrogen bomb" in its Operation Shakti tests ("Shakti I", specifically), though seismographic readings have led many non-Indian experts to conclude that this is unlikely, or at least it was unlikely to have been a success as claimed, because of its low yield (claimed to be around 45 kt, though outside experts estimate it at around 30 kt, both extremely low for a successful thermonuclear detonation). However even low-yield tests can have a bearing on thermonuclear capability, as they can provide information on the behavior of primaries without the full ignition of secondaries. 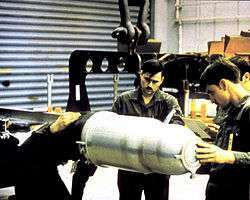 Photographs of warhead casings, such as this one of the W80 nuclear warhead, allow for some speculation as to the relative size and shapes of the primaries and secondaries in U.S. thermonuclear weapons. The Teller–Ulam design was for many years considered one of the top nuclear secrets, and even today it is not discussed in any detail by official publications with origins "behind the fence" of classification. United States Department of Energy (DOE) policy has been, and continues to be, that they do not acknowledge when "leaks" occur, because doing such would acknowledge the accuracy of the supposed leaked information. Aside from images of the warhead casing (but never of the "physics package" itself), most information in the public domain about this design is regulated to a few terse statements by the DOE and the work of a few individual investigators. Below is a short discussion of the events which led to the formation of these "public" models of the Teller–Ulam design, with some discussions as to their differences and disagreements with those principles outlined above. The general principles of the "classical Super" design were public knowledge even before thermonuclear weapons were first tested. After President Truman ordered the crash program to develop the H-bomb in January 1950 the Boston Daily Globe published a cutaway description of a hypothetical H-bomb with the caption Artist's conception of how H-bomb might work using atomic bomb as a mere "trigger" to generate enough heat to set up the H-bomb's "thermonuclear fusion" process. The fact that a large proportion of the yield of a thermonuclear device stems from the fission of a uranium 238 tamper (fission-fusion-fission principle) was revealed when the Castle Bravo test "ran away," producing a much higher yield than originally estimated and creating large amounts of nuclear fallout. Whether these statements vindicate some or all of the models presented above is up for interpretation, and official U.S. government releases about the technical details of nuclear weapons have been purposely equivocating in the past (e.g. Smyth Report). Other information, such as the types of fuel used in some of the early weapons, has been declassified, though precise technical information has not been. Morland eventually concluded that the "secret" was that the primary and secondary were kept separate and that radiation pressure from the primary compressed the secondary before igniting it. When an early draft of the article, to be published in The Progressive magazine, was sent to the DOE after falling into the hands of a professor who was opposed to Morland's goal, the DOE requested that the article not be published, and pressed for a temporary injunction. After a short court hearing in which the DOE argued that Morland's information was (1). likely derived from classified sources, 2. if not derived from classified sources, itself counted as "secret" information under the "born secret" clause of the 1954 Atomic Energy Act, and (3). dangerous and would encourage nuclear proliferation, Morland and his lawyers disagreed on all points, but the injunction was granted, as the judge in the case thought that it was safer to grant the injunction and allow Morland, et al., to appeal, which they did in United States v. The Progressive, et al. (1979). Through a variety of more complicated circumstances, the DOE case began to wane, as it became clear that some of the data they were attempting to claim as "secret" had been published in a students' encyclopedia a few years earlier. After another H-bomb speculator, Chuck Hansen, had his own ideas about the "secret" (quite different from Morland's) published in a Wisconsin newspaper, the DOE claimed The Progressive case was moot, dropped their suit and allowed the magazine to publish, which it did in November 1979. Morland had by then, however, changed his opinion of how the bomb worked, suggesting that a foam medium (the polystyrene) rather than radiation pressure was used to compress the secondary, and that in the secondary was a sparkplug of fissile material as well. He published these changes, based in part on the proceedings of the appeals trial, as a short errata in The Progressive a month later. In 1981, Morland published a book, The secret that exploded, about his experience, describing in detail the train of thought which led him to his conclusions about the "secret". Because the DOE sought to censor Morland's work—one of the few times they violated their usual approach of not acknowledging "secret" material which had been released—it is interpreted as being at least partially correct, though to what degree it lacks information or has incorrect information is not known with any great confidence. The difficulty which a number of nations had in developing the Teller–Ulam design (even when they understood the design, such as with the United Kingdom) makes it somewhat unlikely that this simple information alone is what provides the ability to manufacture thermonuclear weapons. Nevertheless, the ideas put forward by Morland in 1979 have been the basis for all current speculation on the Teller–Ulam design. ↑ The term "heterocatalytic" was Teller and Ulam's jargon for their new idea; using an atomic explosion to ignite a secondary explosion in a mass of fuel located outside the initiating bomb. ↑ Teller, Edward; Ulam, Stanislaw (March 9, 1951). "On Heterocatalytic Detonations I. Hydrodynamic Lenses and Radiation Mirrors" (PDF). LAMS-1225. Los Alamos Scientific Laboratory. Retrieved September 26, 2014. on the Nuclear Non-Proliferation Institute website. This is the original classified paper by Teller and Ulam proposing staged implosion. This declassified version is heavily redacted, leaving only a few paragraphs. Gary Stix, "Infamy and honor at the Atomic Café: Edward Teller has no regrets about his contentious career," Scientific American (October 1999): p.
↑ Bethe, Hans (1952). 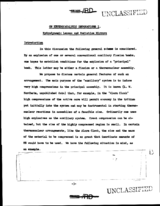 "Memorandum on the History of the Thermonuclear Program". Federation of American Scientists. Retrieved 2007-12-15. ↑ Bethe, Hans (1954). "Testimony in the Matter of J. Robert Oppenheimer". Atomic Archive. Retrieved 2006-11-10. 1 2 "Why the H-Bomb Is Now Called the 3-F". LIFE: 54–55. 5 Dec 1955. ↑ "The Tsar Bomba ("King of Bombs")". Retrieved 2010-10-10. from fireball radius scaling laws, one would expect the fireball to reach down and engulf the ground ... In fact, the shock wave reaches the ground ... and bounces upward, striking the bottom of the fireball, ... preventing actual contact with the ground. ↑ "Hail Truman H-Bomb Order". Boston Daily Globe: 1. February 1, 1950. – reprinted in Alex Wellerstein (June 18, 2012). "What If Truman Hadn't Ordered the H-bomb Crash Program?". Peter Galison and Barton Bernstein, "In any light: Scientists and the decision to build the Superbomb, 1942–1954" Historical Studies in the Physical and Biological Sciences Vol. 19, No. 2 (1989): 267–347. Gary Stix, "Infamy and honor at the Atomic Café: Edward Teller has no regrets about his contentious career," Scientific American (October 1999): 42–43. De Geer, Lars-Erik (1991). "The radioactive signature of the hydrogen bomb" (PDF). Science and Global Security. 2: 351–363. doi:10.1080/08929889108426372. Yuli Khariton and Yuri Smirnov, "The Khariton version" Bulletin of the Atomic Scientists Vol. 49, No. 4 (May 1993): 20–31.